NORBERTO DE LA RIESTRA, Argentina (Reuters) - Argentine farmer Mario Giustocio looks out at a series of ponds that have formed over a field that should be green with shin-high soy plants by now. It is sunny but the weather forecast says more rain may be on the way. 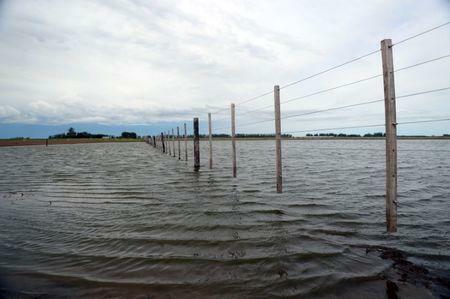 His land in eastern Buenos Aires province was lashed by 755 millimeters (30 inches) of rain from October to December, compared with the 250 millimeters that normally fall during that period. "We're worried because the forecast for January through March says it's going to keep raining more than normal and the soil is already saturated," said Giustocio, speaking over the mooing of cows wading around and drinking from fields he had slated for soybeans before the deluge. 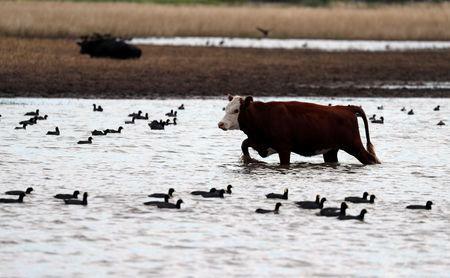 Ducks paddle nearby. Argentina is a major exporter of the oilseed and the world's No. 1 supplier of soymeal livestock feed. The main soy region of Argentina is to the north and is on track to deliver a healthy crop of 50 million tonnes or more. But the floods here in the community of Norberto de la Riastra are like a cruel joke after a drought roasted Giustocio's farm and others across the Pampas grain belt last season. The drought cut last year's soy output to 37 million tonnes from about 55 million tonnes initially expected. Giustocio, who manages 4,000 hectares, says he lost 30 percent of his early-seeded soybeans, and has not been able to sow his late-season crop. The ideal deadline for planting is the end of the year, but he wants to try planting later this month if his fields become dry enough. Even if he manages to get some seeds into the ground, yields would likely be very low. Giustocio's plight is emblematic of the crisis facing hundreds of farmers on the periphery of Argentina's main farm production area, a famously fertile region centered in northern Buenos Aires and southern Santa Fe and Cordoba provinces. About 2 million of the 17.8 million hectares planted with soy, Argentina's main cash crop, have been damaged by heavy rains related to the El Nino weather phenomenon this season, Argentina's two main grains exchanges told Reuters. "The forecasts indicate more problems in marginal growing areas, but not in key soy-growing regions. So in general, the picture is still good," said Esteban Copati, head analyst at the Buenos Aires Grains Exchange. 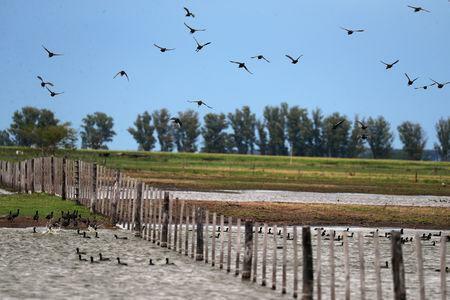 As one of the world's key grains exporters, Argentina has always depended on good weather. But this year, with the economy in recession, agricultural export tax revenue is crucial. "The harvest will depend on the weather and the economy will depend to a great extent on the harvest," said Julio Calzada, chief economist at the Rosario grains exchange. The Rosario grains exchange estimates the 2018/19 crop at 50 million tonnes. But that depends on whether the flooding worsens. "The concern is that weather volatility could continue through the end of January," Calzada said, noting that soil water levels are already at or beyond their limits. Forecast models show the rain continuing across Argentina over the next two weeks, with the wettest weather occurring in northern regions of the country where little soy is grown, according to analysts with Refinitiv Agriculture Research. The models show the country should start drying out by mid-February. More than 96 percent of Argentina's 2018/19 soy has been planted. Harvesting occurs in March through May. Giustocio, his feet sinking in mud as he gives a tour of his farm to a Reuters reporter, just wants to get back to planting. The dirt road leading to his property has been cleared of tree stumps and other remnants of the flooding. The debris is piled up next to fields where sparse green shoots sprout in soil that still needs days to dry out. "If it does not rain over the next few days we will try to plant again. After that, it will be too late," he said.